I am Sharon Hale and I'm 47 years old. Many thanks for taking the time to check out my bears. I have been busy during the last 19 years making a large number of original mohair bears. I want to thank my mum Julie. Without her support, I possibly would have not fulfilled my big dream of having a business I really like so much. I've 2 boys and a lovely husband who supports me. E Commerce has given me have the ability to stay home with the kids throughout their childhood which is very important to me. I first got thinking about bears whenever a friend and I visited a bear display at Camberwell City hall in Melbourne. I fell completely head over heals deeply in love with a lovely little bear 10 cm high. He was not on the market but was in a package to make, therefore i attended a class and also never looked back. About 11 years back my mum Julie opened up her home enabling me to conduct courses during the night. We still do them nowadays ,and on Mon Tuesday and Wednesday from 7pm until 9.30 you'll hear 8 women actively chatting and having a great time making bears,. I still involve some of my original students who've become great friends. I have never felt I possibly could not make another , and I've thought to myself when that day time comes it's time to fully stop. I have become very keen on “Shabby Chic ” and several of my bears signify that appearance. I also love vintage and older tins and nick knacks. 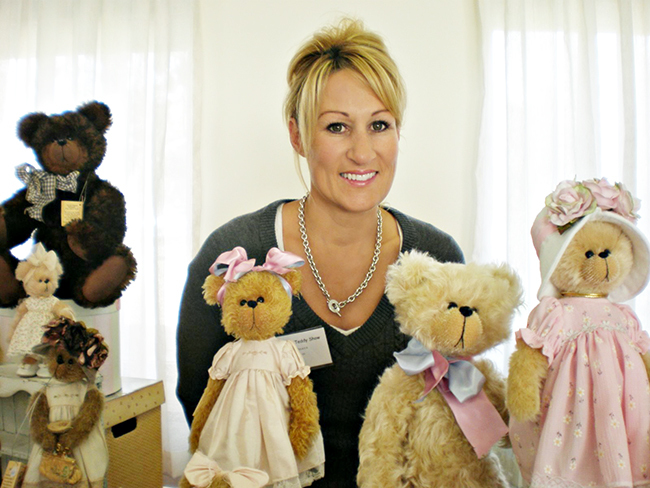 I would want to thank my many customers who've been buying my bears and assisting me through the years, Many have big collections (Probably bigger than my very own, “shaz bears” collection.) I simply hope when you purchase my bears, you'll feel it is just like a little friend , so when you gaze upon them they'll put a smile on your face.